We’d love your help. 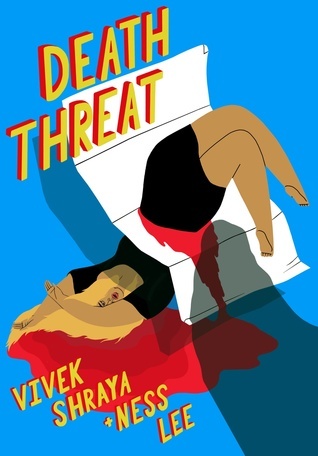 Let us know what’s wrong with this preview of Death Threat by Vivek Shraya. To ask other readers questions about Death Threat, please sign up. I'm a big fan of graphic memoirs, and a big fan of Shraya, so naturally I was eager for this book's release. Having just finished it though, I feel disappointed. I think it had to do with the artwork.... For some reason the artwork just didn't connect me to the story and I was left feeling less emotional than I expected. I might try reading it again in the future to see how I feel. The illustrations were really powerful (particularly at the very end), I just found this a little too meta for my liking. I love Vivek Shraya's work, I just had a harder time connecting with this one. As always, Vivek can be counted on to produce a work quite unlike anything else you’ve come across before. Death Threat is an interesting artist act of transforming hate into art. It would be a great teaching tool, within a classroom context, for launching a discussion about all manner of things related to transphobia, hate speech and the internet… as well as the creative process. This graphic novel by Vivek is a powerful work.